This post describes in detail how to add GPS data to video file using `visual correlation' (see also: Video geocoding with gpsbabel). 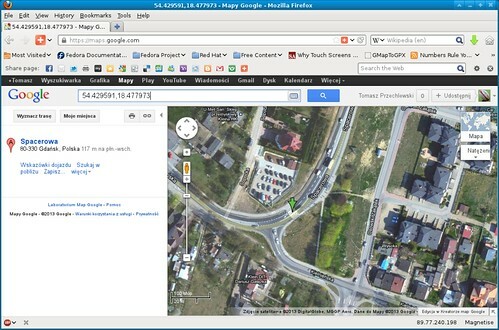 There is an easy way to augment video files with GPS data using GPSbabel. Since version 1.4 of GPSBabel is able to create a subtitle file from a GPS tracklog. The subtitle contains latitude/longitude/altitude as well as the time. With a simple Perl scripts I have added current speed (not particularly accurate however). Where: video_time -- video position (relative to beginning of video) for which exact corresponding GPS timestamp is known. gps_time -- the time part of the GPS timestamp which corresponds to a known position in the video. gps_date -- the date part of the GPS timestamp which corresponds to a known position in the video. Just to remind: internally all GPS units record time/date using Coordinated Universal Time aka Greenwich Mean Time vel Zulu time (for army enthusiasts). What the unit displays is another matter (usually it displays local time).